Voco Sukhumvit Bangkok marks the debut of IHG’s newest brand in Thailand. Bangkok will become the home for the first voco branded hotel in Southeast Asia, the burgeoning InterContinental Hotels Group brand has announced. Due to open in 2021 in the sprawling Thailand capital, the voco Bangkok Sukhumvit – owned by B&G Estate Co Ltd – will consist of 300 guest rooms and will be located near the Nana BTS station for easy access to the city. The precinct also offers a variety of restaurants and entertainment options and is shaping as one of the capital’s fastest-growing areas. Two restaurants will feature within the hotel itself, ranging from an all-day restaurant to a rooftop eatery and bar. Guests can also access a fitness centre and swimming pool with swim-up bar. Meeting facilities capable of catering for up to 400 people will be on-site also, with the largest individual meeting room able to handle 200 guests. IHG’s newest brand is inspired by the Latin word ‘voco’ which means to ‘come together’. There are currently four voco properties either open or scheduled for Australia, led by the flagship voco Gold Coast. Additional locations are due to come in the Yarra Valley, Melbourne and Hunter Valley. “As the world’s most visited destination, Bangkok represents an excellent launch market for one of the newest additions to our brand portfolio. 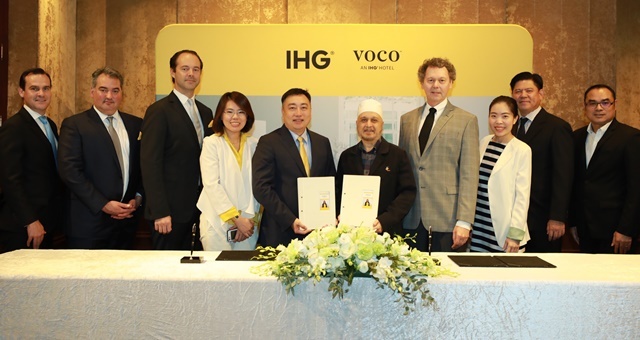 This signing continues the accelerated growth of the voco brand since we launched it last June,” said IHG Managing Director, South East Asia & Korea, Clarence Tan. IHG’s current Thailand portfolio consists of 24 hotels, with another 27 in the pipeline for the next 3-5 years.